The Economist's Cannes Lion-winning campaign revealed the value of using data creatively, Russell Marsh writes. A simple story told well. That’s the key to good communications. We are people, after all, not robots. And it’s people who tell the stories, not technology. But technology in media does give us the ability to find people fast. The story behind UM London’s data-driven campaign for The Economist, which was awarded a bronze Lion in Cannes, underlined that, when creative and data come together in a smart way, they can do incredible things. When you have such wide-ranging content as The Economist has, how do you reach a audience with something that connects and also makes people take that extra step to subscribe? With so much content available on the web for free, finding people willing to pay £155 a year for The Economist is never going to be an easy task. Many people didn’t appreciate The Economist’s breadth of content. Despite the name, the magazine covers much more than just economics. One of the challenges was that millennials were not going to The Economist for their current-affairs fix. A pity since its content, being liberal and focused on fighting ignorance, is incredibly relevant to this audience. To achieve The Economist’s objectives of engaging with potential readers across 13 markets, UM’s key requirement was to demonstrate why its content was relevant. The approach taken was different. Rather than standard demographics, it looked at current subscribers and mapped their psychographic profiles. Forget where someone lives and how much they earn, how people are connected through the topics that are important to them as human beings was the key here. Using existing subscriber data, UM collaborated with the Economist data team to work backwards and model the key metrics of its audience based on their common psychographic. This became the core algorithm to drive targeting: human insights driving data descriptions. With this in place, they could find and identify which topics resonated with people based on what was important to them, whether they were a builder or a banker. This concept was then scaled using data on other platforms to find lookalikes who behaved in a similar manner. Next, UM’s advanced media buying platform (Cadreon) provided a way to find people whom they could match with specific content. The team then had to bring in the human element to add the heart to the stories. UM worked with Proximity to craft punchy and hard-hitting headlines they could tie to the content. 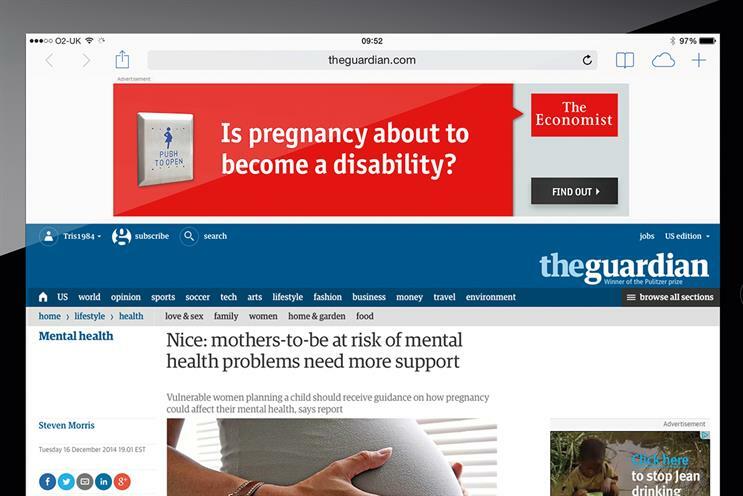 All advertising was contextually targeted so, on sites such as The Guardian, they were able to place headlines that talked about pregnancy right above a news story talking about this subject. The team knew the audience was interested in that subject, and so extending that story through The Economist’s own headline added a new dimension that extended the dialogue beyond advertising. It became an extension of a topic readers wanted to know about. All of this was identified, profiled, built and delivered in real time, giving The Economist the reach and optimisation to be relevant to many more people than ever could have been possible using traditional media planning strategies. In only two months, the campaign delivered more than three million prospects, exceeding the target by 330 per cent and the new-subscriber target by 523 per cent. I believe what made this campaign special is that it illustrated how data and creative, when brought together at scale to tell a seamless human story, can have a big impact on many people’s personal experience of a brand.